The EU General Data Protection Regulation (GDPR) was designed to harmonize data privacy laws across Europe, to protect and empower all EU citizens’ data privacy and to reshape the way organizations across the region approach data privacy. The key aspects of GDPR, as well as information on its business impact, can be found throughout this site. The data controller is then playing a major role here and is the main responsible for GDPR application. However, as we will see, in case of Blockchain products and services, it might not always be obvious who the data controller is. Blockchain is simply a decentralized database. It means that many actors keep a copy of information and can propose signed modifications or transactions that are then approved thanks to consensus mechanisms. Blockchain technology has a huge potential as it allows to store information, and perform transactions without the need of a centralized entity. When Blockchain appeared, with Bitcoin, its main purpose was to disrupt banks and finacial transactions. It was also aiming to preserve the privacy of its users. All it needed to know to perform a transaction was the wallet addresses of the sender and the recipient. However, a lot of improvement has been done since then. Thanks mainly to smart contracts, it is now possible to perform complex transactions involving much more data than just a wallet address. Considering the intrinsic characteristics of Blockchain, it seems, at first glance at least, difficult to imagine a GDPR compliant Blockchain. However, as nicely said in the ConsenSys report made on behalf of the European Union blockchain observatory and forum, “GDPR compliance is not about the technology, it is about how the technology is used”. Bitcoin is the first application of Blockchain and it’s, without doubt, the most famous. Bitcoin is using a public permissionless Blockchain network. It means that anyone can join and participate to the network. Private: The Blocks are not visible to anyone. An autority is responsible for providing access to some users or entities. For example, many banks and entreprises are experimenting or running private Blockchain-based solutions. Permissioned: The Blockchain can be private or public (anyone can see the the blocks). However, an autority is providing permission to some entities to validate and run the network. For example, Ripple is using a permissioned Blockchain. 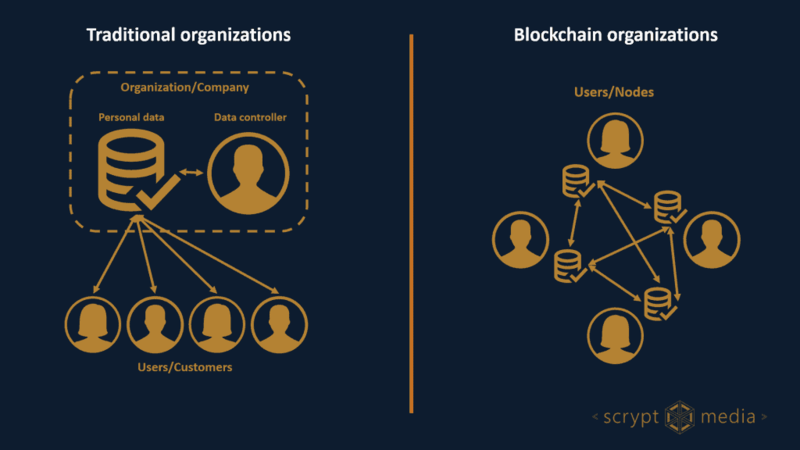 Who is the data controller in a Blockchain? 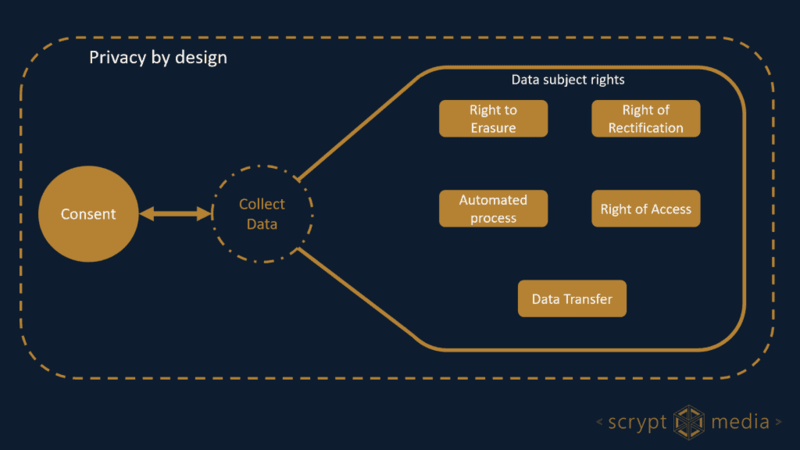 In the case of a private and/or permissioned Blockchain network, it seems obvious that the Authority controlling the access should be considered as the data controller. In the case of public Blockchain however, it seems a bit more tricky. The answer to the question is (drum roll): We don’t know yet! Indeed, In a public permissionless Blockchain, there are still some debates about this question. While almost everyone agrees that developers of the Blockchain network (Ethereum for example), the nodes (including miners) and the users (the ones requesting transactions) cannot be considered as data controllers. There is still a debate about the smart contract publishers. Indeed, behind smart contracts, there are usually entities and startups proposing a service for which they might need to collect personal data. Should companies store their unanonymised customers name, address, phone and credit card numbers in a public Blockchain? The answer is clearly “NO! Don’t even think about it!”. It would be the equivalent of Facebook cancelling all their data privacy settings and allowing everyone to see everyone’s data. But Personal Data, according to GDPR, are not only data that are obviously linked to the identity of a user. Its definition is much wider than this and concerns “any information relating to an identifed or identifable natural person”. If we really want to strictly apply this definiton, even wallet address, encrypted and hashed data can be considered as personal data if the techniques used are not strong enough to prevent hacking or pattern analysis. As seen before, one of the main issue with GDPR application in a public Blockchain Network is how to identify the data controller. If this entity is not clearly defined it seems difficult for data subjects to execute their GDPR rights. For example, Who are they giving their consent to? Who should they contact to request their right to access or right for data erasure (if there is any way to erase data from the Blockchain)? In addition to this, the fact that many Blockchain projects are developed by open source communities, nothing (and no one) can guarantee that the solution will be “data protection per design”. Blockchain and GDPR: The impossible love? Indeed, it seems impossible to comply to GDPR when using Blockchain. But as said above, there is no GDPR compliant technology. It all depends on how the technology is used. In the meantime, the previously mentioned report is providing some great principles that Blockchain solution entrepreneurs and designers should try to follow to avoid any GDPR breach. Principle 1: Start with the big picture: how is user value created, how is data used, and do you really need blockchain? Principle 2: Avoid storing personal data on a blockchain. Make full use of data obfuscation, encryption and aggregation techniques in order to anonymise data. Principle 3: Collect personal data off-chain or, if the blockchain can’t be avoided, on private, permissioned blockchain networks. Consider personal data carefully when connecting private blockchains with public ones. Principle 4: Continue to innovate, and be as clear and transparent as possible with users. Principle 5: Integrate with secured Digitial Identity solutions where users OWN their personal data. Use and process the data they provide you access to only when needed and in all transparency. Innovators shouldn’t ignore the data privacy of their customers. One of Blockchain’s first purposes was to give back power to the people. It gave them financial alternatives where they didn’t need middlemen (banks) anymore to exchange value. The entrepreneurs and designers using Blockchain should keep this in mind. They should design a solution where customers will have full control of their personal data. Do you like this article? Do you have any remark/suggestion to it? Please let us know in the comments!